Ancestry.com is packed with all kinds of mostly-undiscovered genealogical treasures–and some of them you’ll never find from a search box. Here, expert Nancy Hendrickson shares some favorite treasures, tips for finding them, and reminders for improving your research. Ancestry.com is a “genealogy giant:” one of the four biggest global records resources. Whether you subscribe or have free access through your local library or Family History Center, you should not miss exploring this website for your family history. You probably already know that–but are you getting all you can out of Ancestry.com’s vast collections and many research tools? Nancy Hendrickson, the author of the best-selling book Unofficial Ancestry.com Workbook: A How-To Manual for Tracing Your Family Tree on the #1 Genealogy Website, is here to share tips for taking your research to the next level. We’ve added in some examples and additional things to consider. 1. Verify what you learn. Nobody wants to discover conflicting information, of course. But you DO want to know if something is inaccurate before it leads you down a wrong research path. The best thing about verifying facts in additional sources is that sometimes you find NEW or BETTER information: parents’ names, a middle name that proves key to someone’s identity, a burial place. Let’s say you find an ancestor’s death date in the Social Security Death Index. Don’t stop there! The SSDI is sometimes wrong and the information it contains is definitely limited. 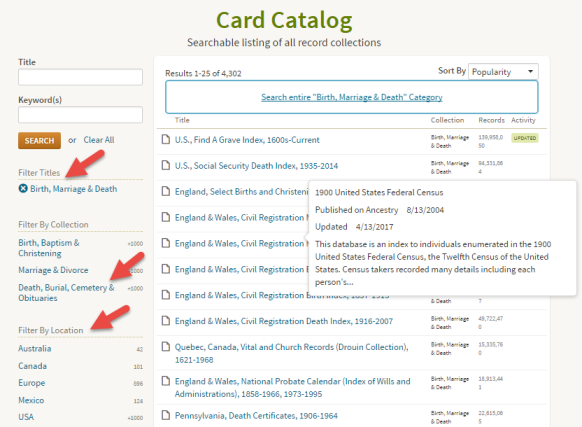 Use the Ancestry.com Catalog to see what records about death may be on the site for that time and place. Under Search, select Catalog, then use the filters on the left side to drill down to death records for the location you want. Remember that records collections have been created on a specific geographical level: try local, regional (such as state or province) as well as national levels. 2. Don’t just repeat what other people’s trees say. Just because seven different online trees name the same parents doesn’t mean it’s accurate. Those folks may all be misquoting the same wrong source! Purple arrows: Multiple pieces of very specific information are the same on your tree and another one. Red arrow: You see sources attached to that person’s profile, such as the news article thumbnail seen here. (Note the difference with the record shown below, with just an empty profile image.) Yes–you do want to see that news article! Blue arrow: In addition to either of the above, you also see specific information that is unknown to you. Then you’ll be able to check out the news article along with the other sources and records attached to this person’s profile. You won’t just see what that person thinks about your common ancestor–you’ll see evidence of why she thinks it. 3. Ancestry.com has more than indexed historical documents. U.S., County and Regional Histories and Atlases, 1804-1984: This is a browse-only collection of “more than 2,200 volumes of county and regional histories from California, Illinois, Indiana, Michigan, New York, Ohio, Pennsylvania, and Wisconsin….In them you’ll find history, biographical sketches, maps, business notices, statistics and population numbers, pictures, descriptions of industry and business, stories of early settlement and pioneers, colleges and universities, military history, geography, and plenty of other details.” Reminder: you can’t search this database by an ancestor’s name. Instead, look for places, and then start reading. Historic Land Ownership and Reference Atlases, 1507-2000 collection of maps and atlases detailing land areas that comprise the present-day United States and Canada, as well as various other parts of the world. It contains a variety of maps and atlases created for different scopes and purposes, including land ownership atlases and bird’s-eye view maps. Land ownership atlases usually show the names of contemporary owners or occupants of land and structures. Some of the maps depict countries and wider geographical areas, while others depict counties, cities, towns, and smaller geographical areas. 4. Ancestry owns a lot of other web resources. Search these too! Search results from Ancestry.com do include Find A Grave entries. Many of these contain additional information about the deceased and links to their relatives (remember to confirm the information you find here). 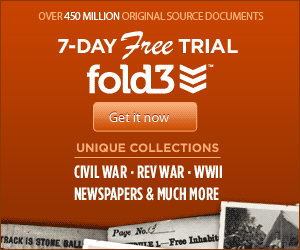 Fold3 is home to millions of U.S. military records. Ancestry.com subscribers can upgrade their subscription to include Fold3 access, or you can subscribe separately. 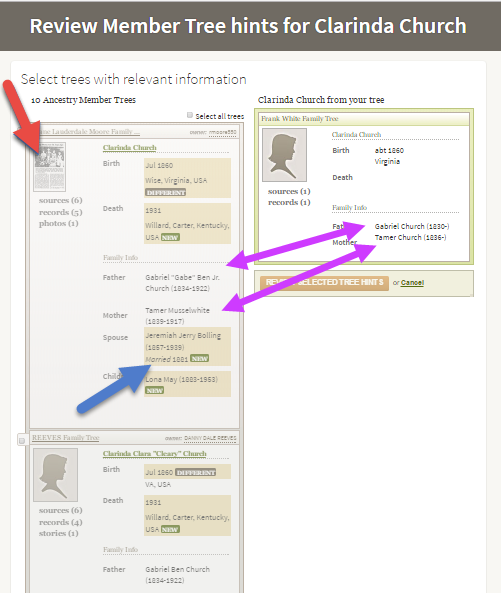 RootsWeb: This is a free and long-lived family history web resource, now hosted by Ancestry. “The primary purpose and function of RootsWeb.com is to connect people so that they can help each other and share genealogical research,” says the site. “Most resources on RootsWeb.com are designed to facilitate such connections.” Click here to learn how to get started with RootsWeb. Nancy’s best-selling book, The Unofficial Guide to Ancestry.com, has everything you need to become an Ancestry power user! 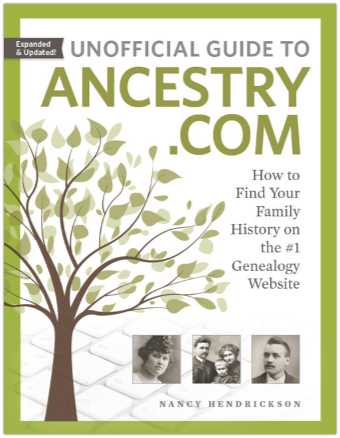 This book will help you get the most out of your Ancestry.com subscription by showing you how to find answers to your family tree questions within its billions of records and massive network of family trees. This recently updated 2nd Edition reflects the site’s many changes, with screenshots that demonstrate how to create family trees, navigate the site, and use Ancestry.com’s search engines. A new section on AncestryDNA will also help you dive deeper into your research, with detailed guides to interpreting test results and applying them to research. Click here to order your copy in print or ebook format. This article was originally posted on May 22, 2017.